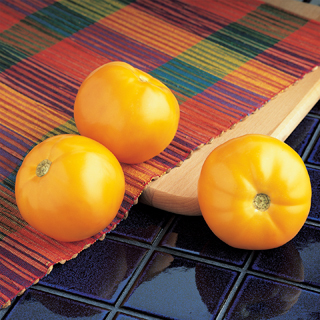 Sweet, mild flavorful tomatoes turn a beautiful golden yellow at maturity. Firm and meaty, this low-acid tomato has very few seeds and is tolerant to cracking. Unifrom ripening of exra large fruit beginning early to mid summer. 7.7 - 10 oz fruit. 75 days. Slightly flattened I 7.7-10 oz.